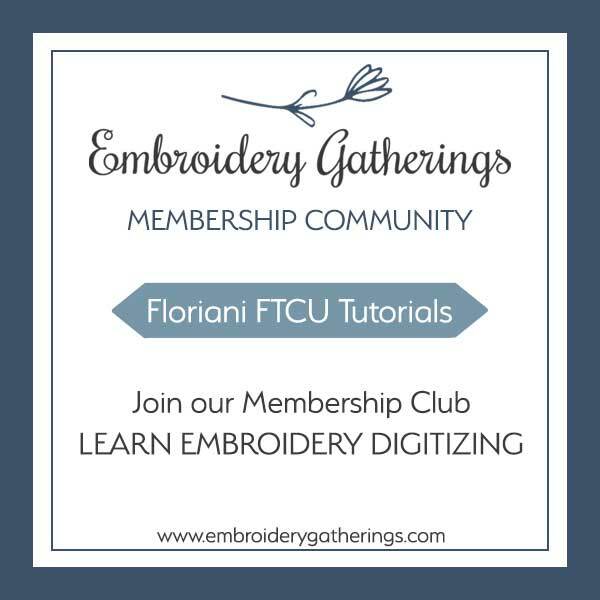 Floriani FTCU has a built-in feature that will sort multiple thread colors in the Sequence View. This can be very helpful to use after digitizing your design. 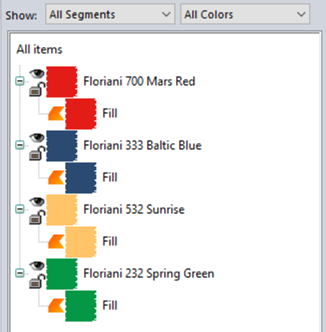 Here is a reader question that asks about combining thread colors. For this segment you will be using a FILL stitch. Now you can copy and paste the square shape instead of tracing it again. Now you can copy and paste ALL 4 squares to create 8 squares for this sample design. 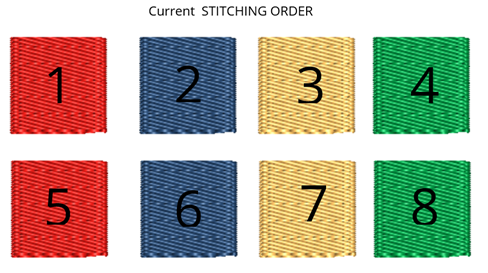 When looking at the sequence view, you can see that the SAME red thread color will be stitching 2x. But there will be 3 other color changes in between. BOTH red shapes stitched one after the other. And, stitching a design, on your machine, would be a lot more efficient, if you did not have to stop and change the thread so many times! 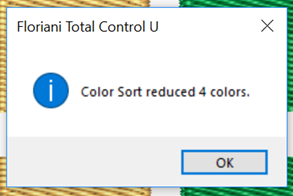 A message box will appear on the screen to tell you how many colors were combined and sorted. 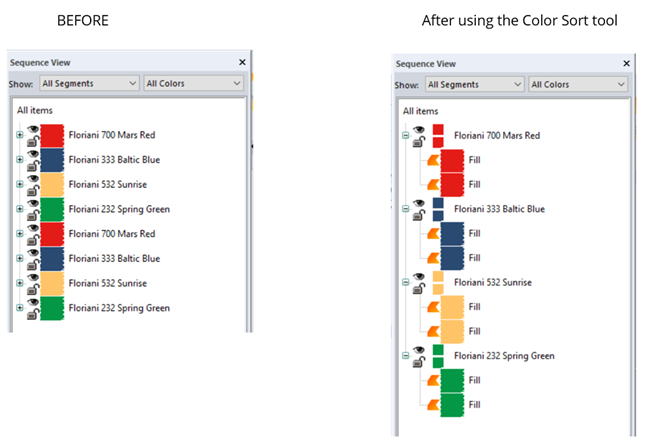 There are some instances when you would NOT want to rearrange ALL the colors in the sequence view to color sort them. This would happen when you need them to stitch in a specific order. For example, if you have 2 green leaves and one leaf is behind the other leaf. The shape in the back obviously needs to stitch first. 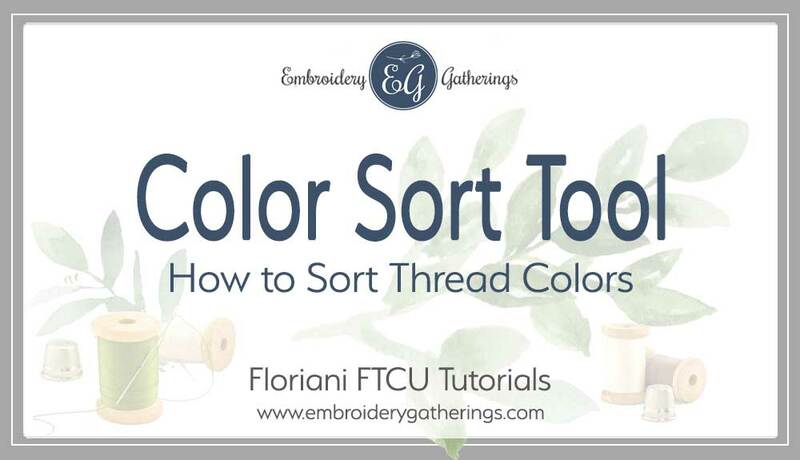 Usually FTCU does a good job of recognizing this, but sometimes you have to manually re-edit the stitching order in the sequence view after you have used the color sort. 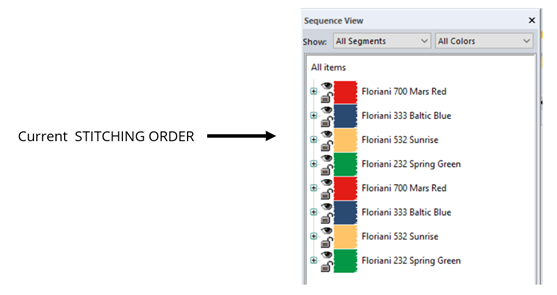 It is a good practice to use the STITCH PLAYER feature to review how your design sequence will stitch for you. This will give you a chance to edit the stitching sequence as needed. You can manually move any of the thread colors in the sequence view by selecting the thread color and left clicking and dragging to rearrange. I will do a future tutorial explaining more about the stitching sequence and how to edit it.